phone conference on Saturday as well. See above for the results. I was planning to catch a late evening flight out of San Francisco. Got there in plenty of time and found that my gate was at the end of the B concourse. I had not even gotten settled when an announcement came in that my gate had been changed to the end of A concourse which meant a long walk back to the hub and out to the end of A. There for all of seven minutes when another announcement came that the gate had been changed yet again to the opposite end of C concourse. This was getting old fast. At least they apologized at the end of this announcement. A hour later it became all too apparent that I would miss my connection in Newark to Buffalo. I told the gate attendant who concurred and re-routed me through Chicago. “What about my luggage?” you might well ask…I certainly did. I was told that it would probably not arrive at the same time and might be in late and they suggested that I talk to the baggage claim person when I got to Buffalo. Upon arriving at Buffalo I discovered that there were two people ahead of me both picking up puppies. You can imagine how long that took. To add insult to injury it turned out that the claims agent was an old friend of some remote relative of the puppy person and of course history had to be caught up on. An hour later I finally had ascertained that those bags would not be in at any time today as there is only one flight to Buffalo from Newark per day and…as suspected, my original flight had missed said connection. They suggested that I return for it the next day. At this point I was tired enough to explain in excruciatingly plain English why I had no intention of returning from Toronto to pick up my bag, nor to pay for a hotel for the night to wait for it. They then arranged to have it rerouted to Toronto where they would deliver it to the hotel. Now two hours later than I had planned, I picked up my rental car and headed to Canada…eh. At the boarder the line was almost as long as those from Mexico to the US on a week end. I was really perplexed. How could it take ten minutes to show your passport and drive on? I soon found out. So…what brings you to Canada? Ah…so where are you from? Oh…San Francisco eh? (and no I am not kidding) Isn’t that where that freeway collapsed? Did they ever get that fixed? Well I was really sorry to hear about all that loss of life. Glad you were able to resolve all that then. Well you have a nice trip now. Hooray, we are finally done, but not so fast. Apparently my passport card deserved a good once, twice, and then three times, over before I was finally free to go. I guess he was puzzled that there was no place to stamp the darned thing. A couple of our board pointed out that it could very well be that they were actually using the conversation to determine whether I really was from San Francisco and how nervous I was to be detained. It’s a technique that the Israelis are really very good at. I finally got to the hotel at around four in the afternoon and went straight to the room (after discovering that it was going to cost me $37.00 a night to park the car. I was exhausted but climbed on to the Grand Council meeting for the last half hour catching up on the financial news and views. I then checked my email only to discover that Catherine was down in the lobby of the hotel worried to a nub as she had picked up on my anxiety over the last few hours. I ran down to get her and bring her up to the room to meet Bettina, with whom I was sharing a room for the duration. We decided to go down to the hotel restaurant to eat along with George Stern, the member ship Chair and Jonathan Oskins, from the young adult program who is the age of my son, and who is an intern handling our social media for us. This was not cheap but the service, the food and the conversation convinced me that it was well worth it. The next day we discovered that we were actually over a mile from the site where the meeting was to take place and as a result I drove being totally unable to walk that distance. I felt fortunate to fine a handicapped space right in front of the building and learned that my tag was recognized in Canada so I parked the car in good hope that it would not be molested. This was an incredible building and I was so jealous to discover that Catharine works here on a regular basis. It was designed for interfaith with a large stadium seating auditorium, and rooms actually designed to hold fire ceremonies. One of those rooms had a white agate ceiling and one wall lit from behind. On another of the walls were row upon row, floor to ceiling cabinets where each religion could store its religious paraphernalia. It was absolutely amazing. The room where the board meeting was held was rounded on one end and was floor to ceiling, wall to wall, glass bricks and clear window space on the end and one side. The door to the room was actually the entire wall which simply swung open giving more room by totally incorporating the large central space as well if necessary. Finally at the meeting, we opened with the usual prayer for guidance, patience, and a wish to be reminded that we shouldn’t do bodily harm to one another…well most of that anyway. Our meetings are really very smooth and this one was no different. We operate by a book called Sir John George Bourinot’s Parliamentary Procedure and Practice in the Dominion of Canada which varies only very slightly from Mr. Robert. Its difficult to operate under parliamentary procedure after having worked so long in consensus, but one gets the hang of it. Actually most of the time we reach consensus and calling the question is just a formality. After introductions during which I explained that if it looked like I had slept in my clothes it was because I had and why, we ran to committee reports. During these reports the main topics from just about everyone were really sorting out the membership, building a webpage that was trendy and up to date, and increasing our exposure through that page and social media. I am happy to say that I could report that I had accomplished most of what I had been directed to do as the internal communications chair, namely, help develop the front end web page for general viewing, get a set of lists up for committees, Chair persons etc., and facilitate communication between our members in general. I had also told George, our membership chair, that I would help him sort out the membership database, that had not been updated in 10 years and had over 456 people on it, about a third of which had since left this plane of existence. After that I would help develop a back end database and form system that would allow people to apply on line, get dropped into said database as pending, and a form letter sent out to them with thanks and an explanation of what they could expect next along with a timeline of those expectations. I was able to report that we had achieved most of those goals and were working toward a final resolution of them after which we would begin the process of building the member’s side of the webpage, which we had not yet begun due to the chaos of our membership list. After what the chair refers to as a general utility break, we preceded with one of the more weighty issues at hand. This was a year to update and revise our bylaws which also had not been done in 10 years. Jim Wiggins, NAIN board nomination committee, and former Chair of the American Academy of Religions and School of Religions at Syracuse University, expressed deep gratitude for being allowed this task and immediately dove into the minutia of the process. He told me that it had been his plan right along to bore people so badly that they would soon be fighting to call the question (of passage as read) rather than listen to another word. Brian Farr, a lawyer and also board member, brought up the few points in which we needed to be in compliance with New York state law; namely that standing committees had to have three directors (board members) on said committee in order to be in compliance and all other committees, here in after to be called “special” committees need have only one director. Well!! That put the cat among the chickens. An hour’s dialogue ensued as to which committees should be “special” and which standing. As we have only 13 board members and 11 committees, and no one wanted to serve on more than one committee the conversation was…interesting. Eventually Jim got his way and the by laws were passed with the understanding that he and Brian would work it out with the executive committee at a date time specific which was not set at the meeting. It should always be so easy. As this was our 25th anniversary, we were asked to express our vision or suggestion as to where we would like to go from this point. This year the registration was closed at 170 people because there was no more room. I am always amazed at the amount of exhaustion expressed by the members of the presentation committee upon the accomplishment of a Connect. I’ve put on conventions of 500 with less fuss and only a few team members and no one really felt over worked. At any rate, thinking about Panthea-Con and other conventions that I am aware of, my vision was to think bigger! Think about the space you are planning on and make certain that registration doesn’t have to be closed because the space won’t handle it. Think bigger in fund raising, think bigger in budget, think bigger in programing and supporting programs. This may have been a mistake. The Treasurer picked up the budget and said, “your right. We need to think bigger. I’m taking this budget back and revising it for later presentation today.” And he increased our budget based on fund raising efforts. However, if anyone can do it he can. The Young adult committee wanted to lower the age of young adults applying for the available scholarships to 16 but older, more litigious minds prevailed and we held the line at 18. What I suggested though was that we lower the top end of the program to thirty. I think that calling a thirty-two year old adult with a family and a PhD a “young adult” just gets to be insulting. I know that Jason Pitzl-Waters would agree. He absolutely hates it when we refer to him as the youngster in the group even though most of us either do or could have children his age. That initiative passed by the way. The other thing we did, which was a direct result of thinking bigger, was to add $1000 to the budget and earmark it for high school and middle school students’ programs. The idea here is that the next Connect team use this year to identify schools in their area and offer these funds as an incentive to bring a group of their students to participate in the Connect. It was a very exciting idea and I cannot wait to see what results it will have. Toward the end of the day we began to discuss what we could offer members for their participation and it was decided that the inevitable “tool box” was really past due. It will include a poster very much like the one that Don and I put together for interfaith and I continue to update, a tri-fold of information about NAIN, a template for business cards, post cards, and form letters to help each Connect committee do its work better and help member organizations participate with us. Then ideas began to really get going and so many of them depended upon much more robust programing than Word Press or any of the pre-designed plug and play site builders offer, that I told them that these were great ideas that were rapidly (in fact probably already had) exceeded my expertise and that we would need to consider paying someone to do. We decided to offer a $1000 intern’s position for the next year to someone demonstrating skill in this area; preferably a young adult who could use the funding while continuing with college classes, but frankly I’d take anyone we can turn up. This is not a full time position but project based. If you know of someone that might qualify, let me know. I would really love to have the Covenant more actively involved in the building of NAIN. The last topic of importance was that we discovered that we had two applicants that wished to host NAIN Connect for 2015. This had never happened before and we were very excited. The problem arose when the two sites were offering such divergent advantages. The first is Regina, Saskatchewan which has a population of only 200,000 and is in the middle of the Canadian prairie or Saint Louis, Missouri. There are a great number of pros and cons and we decided to ask both to submit an official proposal time exact, the guide lines to be supplied. We’ll see what comes up. The meeting over we all broke and met for dinner at a local restaurant which purported to be Peruvian but had not one dish with Qui on the menu. It was actually just a rather trendy fusion mix. The food was well prepared but they kept coming up short on menu items and the servings were very skimpy. Service was pathetic and it’s a good thing that I wasn’t reviewing that place. Dinner was a three hour process and I was hungry by the time I got back to the hotel. The fact that the Board paid for it as a celebration of our 25th anniversary and the company was extraordinary was its only saving grace. On Sunday Catherine took me to see Niagara Falls. It was, as the kids say, hella impressive. The Canadian side of the falls, of which the Canadians are justly proud is so amazing. The American side is a falls boarding on steep rapids with the falling water broken up on its way down to the river. The Canadian side is not only a practically sheer drop it’s a horseshoe almost as big as the horseshoe part of Foz du Iguazu. Therefore all the force of the falling water is focused in a very small area. The result is that the mist is so heavy that it creates its own mini weather. You can see it from literally miles away where there are no buildings to block the view. A huge column of mist rising so high into the air that it creates clouds. On the way back we went shopping for clothes and I ended up finding a fine pair of black pants and a couple of tops for cheap at K Mart plus some new underwear and a few other essentials. Both of us realized that having made the investment the suitcase would now come home. It didn’t matter. Four days without clean clothes were more than I could take. And indeed the suitcase did arrive at eleven that even just before I went to bed. We were late getting to bed and early to rise to get to the plenary for the young adults who were this year’s recipients of the scholarships. They were as usual disgustingly accomplished and made me once again wonder what the hell I had done with my own life. Errrr…. I WANT DO OVERS….WAH!!! I really wanted to attend workshops but kept getting waylaid by stray conversations with people who apparently knew me. I wish I could have said the same. I hate faking a knowledge of who I am talking with. Unfortunately the names on the tags were typed in a 6 point type and I would mostly have had my nose buried in their bosoms trying to read their name tags which is a dead giveaway anyhow. The rest of the time I was collecting video for a better version of the History video Bettina and I produced. As I told people before we showed it, remember, you get what you paid for and we produced this on a zero budget. Worst of all they decided to show the darned thing on a wall about forth feet wide by forty feet tall. As one presenter quipped, “Wow, I always wondered what I would look like in IMAX!” As I said, it looked a lot better on the three inch screen in the editing program. At the end of the movie, which I will send a link to shortly, I listed all of the Connects in order of appearance so to speak, and after a bit of space listed “Toronto…eh?”. Greg promised that the audience would kill me, but I was so tired of listening to these clips pontificating that I was desperate for humor of any kind and left it in anyway. The result was that when it got to “Toronto…eh?” at first it got rousing applause, and then as the “eh?” dawned on them everyone broke up and more applause followed. All I can say is that if they were happy with that they should have seen what I could have done with real video rather than Skype recordings; therefore the video camera this year. I did get one comment which I actually believed. This was from a woman who is a professional documentary producer in Canada. She said that it was quite sufficiently done. I am unfortunately totally uncertain of what that actually means. The dinner where this clip was shown was held in a Hall that Catherine explains in more detail but Bettina kept referring to it as Hogwarts and I swear that I kept expecting the candles in the chandeliers to line up and proceed around the room. I was fortunate to have a conversation with a minister whose name constantly eludes me, but who was one of the movers of the Civil Rights Movement along with Martin Luther King told me he’d never met a Witch and was interested to know more. I talked with him for a few minutes and he asked what kind of Witch I was. That question threw me and I asked him to explain a bit more. He said “well we read a lot about how there’s good Witches and Bad Witches and Witches of different colors…” I laughed and said “Well I don’t know if I’d believe what you can read about Witches. So much of it is Hollywood hype and not true. I read a lot about Baptists too.” “Oh well…” he said “ You should believe that! At least half of its true!” A very funny guy. I’ll try to get his interview up for you as well. The last day of the Conference a plenary on and by the First Nations people of Canada took place. Canada is doing a great deal to address the wrongs done to its original people and especially by the government school system that was carried out right up into the 1980s. They estimate that at least four and as much as seven generations of people were irreparably damaged by this forced removal and assimilation. The greatest shame of all is that they modeled their program after that in America which is still going on under some very shaky end run politics. The Creek gentleman who spoke on forgiveness and reconciliation moved me in some very unexpected ways. He is an Anglican Priest but is still in full and complete possession of his native teachings and values. Further, he has managed to integrate them in the most amazing manner. I don’t believe that I could have come to see the world as he has and I believe that he must be a very old and knowledgeable soul to have come to such conclusions. This plenary I taped from the beginning and will put up on You tube for you at a later date when I have time to work on it. A last minute meeting of the board was held to determine that we could not determine anything further about where to hold our Connect in 2015 and it was time to go home. By the way our 2014 Connect will be in Detroit and it would be wonderful to have all my peeps there. This year as always I was alone, with the exception of Catherine who had to work through most of the day, though never really alone with all of the wonderful friends who thought it of sufficient importance that I be there to raise the money to pay my way. I was asked at the last minute to be a part of a prayer ceremony representing the Wicca so I boldly claimed to represent all Neo Pagans and explained that I was of the Wicca. Both male and female, the original source of all things. And allow these fruits to sustain you and all of us until we come together once more. On the drive down from Toronto to Buffalo I stopped to pick up my cane which I left when a group of us had dinner there two nights before and closed out the place. I hate to think what impression we must have made because all I had to do was get to the front desk and the girl recognized me immediately and fetched it from the office for me. We were a bit loud but that’s because we can’t hear anymore. Paul is going to go for hearing aids next week and Bernie forgot to turn his up. I mean…I hardly think that’s our fault. Despite the stop we missed the afternoon traffic which Catherine also mentions in her report. On this drive we picked up a Lady named Christina who is a marvelous violinist. She was a part of a rather large Urantia contingent there at the Connect and needed to get back to Buffalo so we offered her a ride. I learned a few things on this ride. First, I learned that Bettina is a very well-known part of the founding of this religious tradition. She kept telling me that she was known but this young woman was totally star struck that she was actually spending time with THE Bettina Gray. I really got a chuckle out of that…a quiet chuckle of course. I don’t think that I’m going to let Bettina off the hook for a bit on that one. They did explain more about the tradition and Bettina asked me to explain more about Neo-Platonic thought to Christina. We had a great time. Christina most generously picked up the tab for the hotel for the evening, which really was a help to both Bettina and myself. She also paid for the full tank of gas necessary to drop off the car. After we dropped off Bettina at the airport I took her to a post office so that she could send her papers that she had collected, about twenty pounds of them, out in one of those all-you-can-stuff-in boxes so that she didn’t have to pay fifty bucks extra to get them home. She helped me drop off the car as well and the shuttle took us both back to the airport. On the way she told me the funniest story about a woman who was talking to a priest in an interfaith setting. He had asked her what “Urantia” meant. She told him “it’s the name of our planet.” And he returned in all seriousness, “what planet is that?” Sometimes the exercise in interfaith tolerance and understanding can go too far. The current Pope has a history of being friendly to interfaith work. When he was Cardinal Bergoglio, he was a supporter of the United Religions Initiative in his diocese. This is part of a noticeable warming of the Vatican towards the URI. Under Pope John Paul II, the URI was primarily attractive to Catholic dissenters, but the then-Archbishop of San Francisco, William Levada, allowed his diocesan staff and newspaper to promote it without hindrance. At one point, Archbishop Levada told Father Gerry O’Rourke that when O’Rourke was doing interfaith work with the URI he should tell folks that he was doing this on his [the Archbishiop’s] behalf. Under Pope Benedict XVI, William Levada was swiftly brought to Rome and raised to be the head of the Congregation for the Doctrine of the Faith (once known as the Holy Office of the Inquisition). One of the last things Levada did before leaving San Francisco was to invite me to represent the Wiccan community at a service at the cathedral for John Paul II. When Levada was raised to be Cardinal, he invited some URI leaders to join in the festivities in Rome. The URI continued to spread, and attracted donations from Catholic leaders from 2004 onward. Donors acknowledged by the URI included the Archdiocese of Baltimore (2005), the United States Conference of Catholic Bishops (2004), Cardinal Theodore McCarrick, the retired Archbishop of Washington DC (2005), and Archbishop George Niederauer, of the Archdiocese of San Francisco (2008). Fr. James Channan, who served on the URI Global Council from 2002 to 2008, received an award from the Vatican in December 2005 as a “Pioneer of Christian Muslim Dialogue in Pakistan,” indicating Rome’s approval of his interfaith work. This award was granted during the reign of Pope Benedict XVI. Now, the current Pope sponsored and participated in URI activities before coming to Rome. While there is no question that Pope Francis is an ardent and devout Christian and a defender of the faith, throughout his career he has been a friend to interfaith work. Let’s hope that this trend continues, both for him and for the Vatican. Communication is always better than violence; and it is always better to be building relationships than fences. When I first got an email from Rachel asking if I could represent CoG at the yearly meeting of NAIN that was happening in Toronto I started to go through the list of things I would need to do. Rachel was a bit surprised that I did not know about the event, especially since it was happening at the University of Toronto where I am the Coordinator for the Campus Chaplains Association (CCA), but I let her know that Toronto manages events a little different. I immediately contacted Richard Chambers, the Director of the Multifaith Centre at the University of Toronto and he filled me in on the details, and asked if I would be willing to assist with the event in any capacity. My next step was to re-arrange my schedule. I did not have any vacation days left, so I needed to get “creative”. This included working with my manager and arranging to be at morning and evening sessions (after 4:30). I also had to move a coven event from Sunday to Saturday – but that seemed to work better for everyone involved. I was then contacted by Suraj Pasad. He is the Hindu chaplain on the CCA and he was supporting the planning committee to organize various worship activities through the conference. He asked if I would do a Wiccan ritual – not a problem. So I was now registered, listed as a worship leader and Richard knew I would be available to assist, even if only in a limited capacity because of work. Then I got the good news – Rachel was able to make the trip to Toronto! We setup plans for meeting up and we were ready to go. As with most things, the best laid plans always change – and what I’ve learned living in Toronto, prepare for things to be a bit fluid and just go with it. Rachel got re-routed through Chicago but her luggage went to Newark! She got to her hotel about the same time I did – but we just missed each other in the lobby. We eventually connected and she started to introduce me to her friends from NAIN. I finally got to meet Bettina – someone I have heard about for many years in listening to Don’s talk about the Berkeley Interfaith Council. While we were gathering in the lobby to go to dinner, Paul and Jan Chaffee arrived. NOTE to anyone flying into Toronto: do not take a cab from the airport to downtown. It took Paul and Jan 3 hours to get from the airport to downtown during rush hour traffic on a Friday. There is an Express Bus that hooks up to the subway system and costs $3.00 CAN. Also, there is a hotel express bus and someday (they say) there will be a direct transit train connection from the airport to downtown. Yes, I know traffic is bad in the Bay Area but Toronto is now the 4th largest city in North America and has major traffic concerns. During the summer, everyone is leaving town to go to the cottage, so it adds to the fun! We decided to eat dinner at the hotel – the Marriott Courtyard. It was a nice dinner and the waitress was very concerned about ensuring that one of us who needed a gluten-free meal was especially taken care of. After dinner, knowing that Rachel, sans luggage, was okay, I headed home. Saturday would be my day with my coven, as Rachael attended the Board meeting. She will have notes on that. On Sunday, I picked up Rachael early and we headed out for some sightseeing that included Niagara Falls and a search for clothing, as Rachael was still without luggage. We met up with Bettina and walked up Yonge Street to the Brownstone Café for a nice, late lunch before heading to the opening plenary meeting (what they did not know is that I’d always wanted to check out this restaurant, so it was nice to try it!). The Plenary Session was opened with a prayer done by an Elder from the Missasauga First Nation – one of the First Nations that called this area of Ontario home. After many introductions, including Richard introducing me as the coordinator for the CCA, there was a presentation on the Canadian perspective of diversity from three local interfaith and diversity champions, including the Diversity Officer from the City of Toronto. I also got a surprise. Sitting in front of me was a man who arranged a day-long interfaith service that I took part in 3 years prior. He was going to have a presentation about this event and told me that I was in the video he had about the event. How cool was that? Dinner was held at the Hillel headquarters on campus. This gave us an opportunity to meet more people. I met a man who organized an interfaith council in the Kitchner-Waterloo area of Ontario (the home of Blackberry). He is also involved with ISARC – a group of interfaith and social activists who network and influence the Ontario and Canadian governments to enact better laws to reduce the effects of poverty in Canada. We had several friends in common, as one of the chaplains in the CCA is very active in this organization and I have gone to several meetings. On Monday, I was up early and back on campus. The Sikh chaplain in the CCA, Guru Fatah Singh led the morning meditation. These meditations and worship services were scheduled for the “Quiet Room” at the Multifaith Centre. This is a special room designed specifically for silent meditation or prayer services. One wall is a “living wall”. My only complaint about this room is the shape – it is long and narrow – but I’ve done small group rituals in this space and I love that the living wall is on the north wall. During the school year, the space is actively used by students of many faiths. After the prayer services, I checked in with Richard and Rachael, then headed to work for a bit. I wanted to get back for the NAIN Board meeting. Unfortunately, I got back a little late and the room was full, so I decided to attend the Hindu Punjab Fire Ritual. Two of the rooms in the Multifaith Centre are designed with special filtrations systems so that you can have fire in the room without setting off alarms. Suraj Pasad led this ritual. He does a Fire Ritual every Wednesday during the school year for the Hindu Student Association. The room was full and the ritual was very nice. Suraj included his grandchildren in the ritual, so it had a nice family-feeling. At the end, we were given a sweet treat. The Toronto Interfaith Council had a very formal program planned for afterwards. Rachael and friends were heading to the Distillery District for dinner and I thought I should head home for a bit, hungry cats and all. On Tuesday, I was scheduled to do a Wiccan ritual after the morning meditation. I got there in time for the morning meditation, which was done by a woman who practices Celtic Catholicism – basically taking the Catholic mass but using older Celtic prayers as part of the service. It was interesting for me, since I’m definitely on the Celtic Pagan side of things. As her presentation ended, an older man came in and just sat down in one of the chairs and closed his eyes. I wanted to set up for my ritual, but I did not want to disturb him, so I tried to be very careful and deliberate as I moved some of the chairs and setup a small altar. What I did not know, was he had one eye open, watching me as I move around the space (but more on that … latter). Shortly before I started the ritual, he left. I started the ritual with a little overview of Wicca and what we would do – then I did a very simple ritual, blessing the elements, casting a circle, calling the quarters and the Goddess and God. Then I led the group in the Tree meditation. Then it was a matter of just closing everything up. They really enjoyed the meditation and I had a wonderful start to my day. Of course, I had to head back to my job, but I would be able to return for the dinner that night. The dinner was held in the Great Hall at Hart House – one of the student community centres on campus. Hart House is a very old building and the Great Hall looks like it could be the hall of an old, medieval castle. I was a little early, so I took a seat at a table near the center of the room. The man who was meditating before my ritual saw me and asked if he could sit at the same table – of course! Then, things got really interesting. He introduced himself to me as Terry and he told me about how he watched me setup for the ritual. He then went to get some wine and asked if I wanted more water. I told him that I could get it and he said “no, please, let me.” When he brought it back to me, he handed it to me “as priest to priest.” We started to talk more and when he found out my name, we realized that we had met at the NAIN in Fullerton. I had only been there for an afternoon, but he had my business card! As dinner started, they called on Terry to give us the blessing – and yes, it was the Terry sitting across from me. He introduced himself as “Terry of Toronto” and talked about the First Nations people who lived near the Scarboro Mission where he works. He then talked about how the blessing he uses is similar to an older blessing – so he, a Roman Catholic priest and a Jewish woman blessed wine and bread, using their traditional blessings. As it seems to happen for me – coincidences occurred. A chance meeting in Fullerton has come full-circle to this meeting in Toronto. And yes, Don, I found myself surrounded by the Roman Catholics again. I doubt it would be a true interfaith meeting for me without that! Dinner was great – fresh food from the Hart House Farm. Rachael’s video on the 25 years of NAIN was great and to hear from past chairpersons was nice. And, I have a new friend in Terry Gallagher, aka Terry from Toronto. In a final note, I told this story of meeting Terry to a friend of mine – and she was amazed. Seems that he is a very old friend of her family and she has known him since she was 14. Soon, the school year will start for us again. Also, I will need to re-join CoG as I let my coven’s membership lapse last year. When I am ready to fill out paperwork, I’ll ask for a couple of recommendations. Too bad Rachael had a meeting on Saturday; she could have attended our annual tradition of the Stone Soup ritual. Thanks Rachael for letting me tag along on this! I’m sure you will hear more about my adventure in Toronto interfaith. Social Justice through Interfaith The way to walk your spiritual talk! A few days ago a post by Crystal Blanton positing that perhaps Social Justice is the “New Interfaith” appeared in The Wild Hunt. 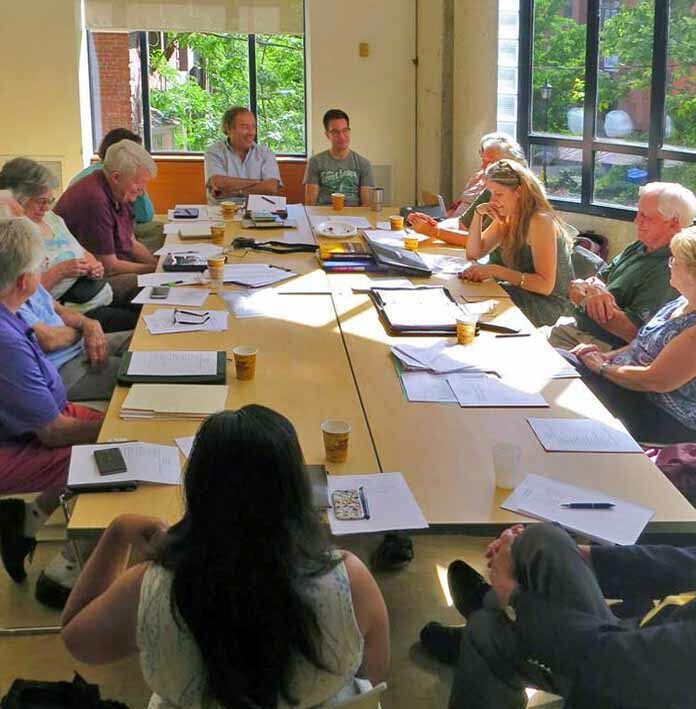 "While Pagans in the Interfaith community continue to work toward religious tolerance, integration, and networking, we are hearing more about the work of social justice in the community. Is social justice becoming the new interfaith?" It caused me to stop and think for a moment. Is this author saying that interfaith is somehow obsolete? Is she saying that Interfaith does not deal with the issues of Social justice? Does she, like so many others, believe that all we do in interfaith settings is hug each other and sing warm and fuzzy songs of faith swaying back and forth while congratulating ourselves on tolerating the “other”? Actually I’m pretty certain that Crystal doesn’t ,but It no longer surprises me to find that most who have not participated in the deeper processes of interfaith believe this. It is however about as far from the truth as any two diametrically opposed ideas can be. While I do not necessarily disagree with any of the ideals discussed in the article, I will take absolute exception to the idea that interfaith work is somehow unrelated to social justice. I am all for any work done in the name of social justice, but social justice outside of the framework of religious practice leaves spiritually behind, as was pointed out by one comment made when the respondent claimed to be conflicted about the idea of this practice outside of his spiritual way of life. Social Justice through the lens of interfaith allows people from any spiritual path to walk their talk, and in particular those who beliefs are based in orthopraxy (right doing) vs. orthodoxy (right thinking or right writings). Social Justice is often the key that opens the door to interfaith practice, allowing a community where there is no previous foundation in interfaith relationship to come together to find common ground. Many groups will begin by working on some issue of social justice together. In working thus, shoulder to shoulder these community members get to know one another on a much more personal level and develop a trust that allows them to enter into deeper relationships with one another. Social Justice is the window, through which different religions may come to view common issues of poverty, and injustice which they can work together to resolve. Social justice has been, since the beginning of the interfaith movement, the common ground upon which people of differing religious beliefs can join together to create a healthy community. A couple of years ago a friend of mine lost a temple to three teens in the aftermath of 911. The temple’s name was Gobind Sadan, and the three young men thought that they were reading Go Bin Laudin. They burned the temple to the ground in New York. Social Justice at work, my friend, a Sikh leader, Ralph Singh, made an impassioned plea to the court for forgiveness of the hatred that caused the young men to do this. "While they must be responsible for the crime that they have committed", he said, "let them be forgiven for the hatred that caused it". The court took him to heart and sentenced the boys to three years each rather than the 30 years each that comes with a crime of hate. Today the boys are out and helping in the community they sought, in ignorance to destroy. Social Justice is the underpinning of every interfaith gathering that I have ever attended. At the Parliament of the World’s Religions in Barcelona I was privileged to sit and listen to indigenous people from all over the world talk of the state of their respective nations and the need for forgiveness in order to move forward in social action. These actions included the reclaiming of languages that were still considered illegal to speak, and land rights still in litigation to name only two of so many. At the Atlanta North American Interfaith Network Connect in 2012 the entire three day event was centered around social justice. We heard from the Mayor and Governor who spoke to the hard work that the early civil rights leaders did on behalf of all people. We heard from ministers who had marched and organized with Martin Luther King Jr. and who, now in their eighties, are still as vigorous in their work on civil rights as they were then. We visited the King Church, and memorial. We visited a food and clothing bank that feeds and clothes the greater part of Atlanta’s working poor. This year in Toronto, we heard from Government leaders who are working on reconciliation and repatriation of their First Nations peoples and from the people who are working toward forgiveness of the atrocities that the Canadian government has perpetuated upon them. We heard from the organizers of “Idle No More”, an originally Canadian, indigenous, grassroots movement. It has spread around the world and is used to protest any number of social issues. Interfaith networks of communication are busily protesting a Papal Bull called The Doctrine of Discovery which has adversely affected legislation of indigenous rights since discovery of the new world and is still the foundation of many US laws affecting First Nations rights. We are fighting to get the last nations refusing to recognize the UN Declaration of the Rights of Indigenous People to sign this ground breaking agreement. The United Religions Initiative is a global interfaith network of Cooperation Circles or CCs (at least seven members of at least three different faith traditions, or spiritualties). Of its almost five hundred individual and independent CCs the majority are focused on issues of social justice. ANT-Hiroshima CC is a non-governmental organization based in Japan which draws its inspiration from the experience of the A-bomb survivors who, together with support from the international community, worked to rebuild their shattered city in a spirit of peace and reconciliation. In a similar spirit, ANT-Hiroshima is involved in a range of relief, reconstruction, and peace-building projects in a number of countries, including Afghanistan, Pakistan, Nepal, and the Philippines. The Prayas Institute for Social Development was registered as a secular, non-profit, voluntary organization in Hyderabad, in the State of Andhra Pradesh. Its members, who are trained social workers of various faiths including Hinduism, Islam, Sikhism and Christianity, come together and focus on development programs for the underprivileged sections of their society in India. One CC of 60 members offers services to women who are the victims of years of armed conflict in the region. They provide counseling, refer women to health centers and encourage women who have few economic means to learn about their rights and legal services. They provide educational programs and lead a small tailoring project to empower women with skills which will potentially enable them to earn an income in Africa. Other groups focus on Indigenous rights and the list goes on…and on. Social Justice is the glue that binds otherwise disparate groups of religious individuals of differing beliefs together and gives that coming together in fellowship and common purpose an absolute and measurable relevance.